It was Grandparents' Day recently, and while I no longer have my grandparents here, I fondly thought of them and how much they taught me, and loved me, over the years. My grandfathers taught me about the outdoors and baseball, for instance. My grandmothers taught me how to sew, embroider, and crochet. I love them for it — I celebrate all of these passions to this very day. At Kreinik we get to hear about many stitchers sharing their knowledge by teaching others. When Claudette Osterreicher sent us photos of her young students stitching with Kreinik threads in an embroidery class, we asked her if we could share the story with others. The smiles on the girls' faces should encourage all of us to keep sharing our time and talents with others. Thank you to Claudette and the parents for letting us share the photos. Claudette, who is a member of the Embroiderer's Association of Canada (http://www.eac.ca) and has won an award for her own needlework, teaches a group of Hutterite ladies and girls in Canada. She shared some of the different Kreinik threads with her students and they wanted to learn more. The colors and textures and variety in the Kreinik line is visually exciting and the threads can be used by all ages. "I am amazed at how fast these girls caught on," Claudette told us. If you are thinking of teaching youngsters in your community, take a note from Claudette about types of projects her students prefer: "They like to make more practical things. They don't do alot of pictures on the wall. 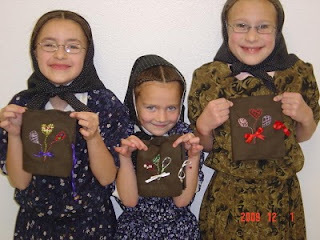 Right now the little ones are doing needle books and the older girls are doing pincushions." A message to Claudette's students: Your work is excellent, Lisa, Helen, Jessica, Maryanne, Niomi and Dorothy! We hope this begins a life-long love of needlework and creativity. You have inspired us to take time and teach others too. Looking for a great gift idea? Gingher has just released their latest series of designer scissors. The series called "Sonia" features white flowers on a firecracker red background. These scissors are produced in very limited quantities. Each series has become instant collectors items. Once these scissors are gone, there will be no more in this series so act fast. Each pair comes with a blade sheath and reusable gift tin. Kreinik offers the "Sonia" scissors in 4" Embroidery, 5" Knife Edge Sewing and 8" Dressmaker Shears. Click here to see these lovely new scissors. Stitcher’s Workshop and Kreinik have teamed up to bring you a challenge! Design a piece (think ornament) that, when stitched on 40ct silk gauze, will fit in a 2″ round area. Don’t forget to include the great Kreinik threads in your design. Silk Mori and the finer metallics will be perfect for this piece! Designs are due in to us by October 1. Grand Prize is $100.00 of Kreinik products. First Prize is $75.00 Gift Certificate*, Second Prize is $50.00 Gift Certificate*, and Third Prize is a $25.00 Gift Certificate*. *Gift certificates are to Stitcher’s Workshop to be used in the shop or online. For more details about this contest visit The Stitchers Workshop.